Mother’s Day is right around the corner. Are you ready? It’s probably been ages since you crafted Mom a handmade gift, but with this fresh and cheeky (and free!) 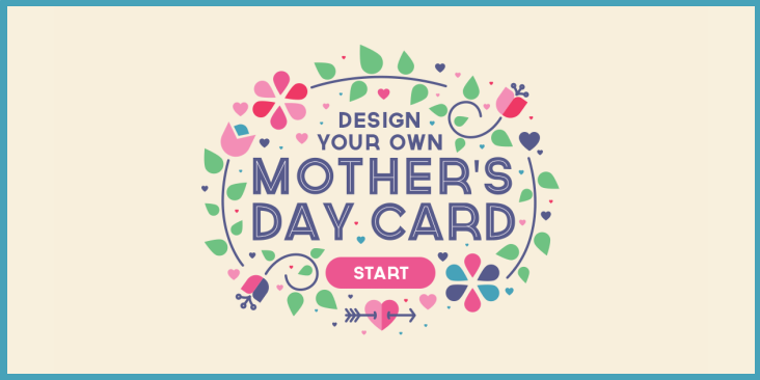 download , we’re giving you a twofer: 1) a fun way to create a handmade e-card for Mom using your amazing Articulate Storyline skills; and 2) a great Storyline project file to repurpose, reverse engineer, or customize with your own images, colors, and text. This design is chock-full of your favorite Storyline features, including variables (true/false and text), branching, states, and triggers. All of these features work together to create an engaging activity that lends itself to re-use as an interactive decision-making tool, a simple game, a creative exercise, and so on—the options are endless. Bonus goodies: we’ve included free hi-res photo images from Unsplash as well as a fabulous color palette and custom illustrations courtesy of Articulate’s own Greg Christman. View this e-card in action. Already designed an e-card that will make Mom proud? Show it off! Grab a screenshot of your creation and share it with us in the comments, in the E-Learning Heroes forums, or on Twitter with the hashtag #ELHCard. Hey Jackie! Looking forward to seeing what you'll create! This should be published for mobile (I try to do that with everything) but give me a shout if it's not working for you so I can troubleshoot. Hi Trina! I first asked after trying it on iPhone 5 where nothing would come up at all (I'm on the latest version of the OS) and HTML5 usually works fine. Since then I've also tried it on iPad where it opens in (the latest version of) the Articulate Mobile Player app. I could eventually get it to advance via the small arrow in the lower right, but it took many taps on each screen. (I hope that's helpful!) The main thing is that it looks fantastic and I love the idea! That's great feedback, Jackie. Thanks for sharing! This is just amazing. Love it!